4 leaves ; 28 cm. Agricultural extension work -- Study and teaching. Agricultural extension workers -- Training of. support for training activities in FSR/E methodology. 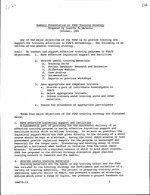 The following is an outline of the general training strategy. b. Select appropriate trainers c. Inform trainers about training units and other materials. These four major objectives of the FSSP training strategy are discussed below. FSSP has proposed in the African strategy discussion paper regional training centers in Cameroon and The Gambia. research and extension, has produced and supported work on FSP/E-intrahousehold case studies, has contributed to documentation holdings, has developed annotated bibliographies to support FSP/E training, and keeps reports on previous training activies. the needs of the clientel. addresses problems of institutionalization of FSP/E projects. provide a take-off point for discussions on the stages of FSR/E. other development practitioners and interested students. Currently, eight case studies are being prepared. on-farm design and analysis exercises in a short course. The choice of trainers can often make or break a training effort. It is important that appropriate trainers are chosen. Trainers should be fluent in the language of delivery, should be knowlegable in FSR/E, and possess basic skills of training delivery. The FSSP strategy in assuring competency in trainers should include developing a pool of individuals knowledgable in FSP/E, selecting appropriate individuals based on the needs of the training effort, informing trainers about the training units and other training materials, and orienting trainers to the course and country in which the training will be delivered. on-farm trials and management and administration issues in FSR/E. on FSR/E orientation in the future. The success of a training effort is often a function of the ability to focus on and respond to the appropriate audience. It is essential that participants have the necessary background to allow for maximum benefit during the workshop. Each participant should be pre-screened for his or her background in FSR/E, and a general information sheet should be filed by each participant to help the trainers focus on their particular audience. As has been suggested previously, the trainers should make preliminary visits to appropriate locations in order to "market" the training course and target specific audiences. This will involve one-on-one meetings, and it is important that as much information as possible be shared. Before such meetings occur, the FSSP should send course offerings to pools of potential participants. A brochure or flyer will serve this purpose well. Another way to contact potential participants is through project design and implementatiorr teams. As a fundamental part of the FSSP training strategy; 'echnical assistance in project design should be offered and a FSR/E training element should be included in designs to the degree possible. This is particularly important to ensure a continued FSR/E ccnponent improvement throughout the life of each project. Given current budgetary constraints of the project (see the technical assistance section of the Africa Strategy discussion paper), these activies must be paid for by USAID buy-ins. their participation in any workshop and be adequately prepared for their participation. This means that they should be given a copy of the agenda and any required reading materials in advance of the workshop. Participants need approximately two weeks to review the proposed agenda and background reading materials.